Overall lowest cost to manufacture, this type of lifting system is the most common among VRC applications. Typically specified for single level operations (ground plus one) without intermediate stops and lower frequency cycle rates. 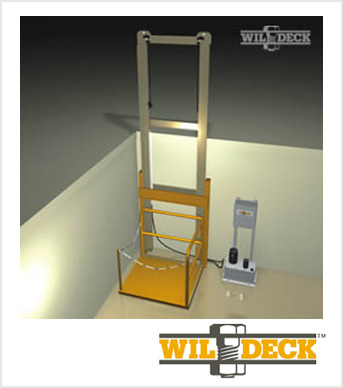 Standard lift capacities up to 4,000 lbs. Design: carriage consists of steel deck plate with railings on non-operating sides and safety chains on operating ends. Carriage is guided between two structural steel members.